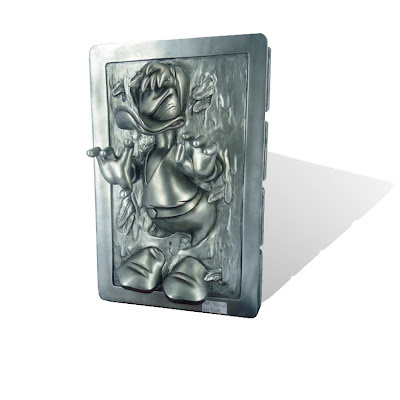 Wanna see some really cool new Disneyfied statues of the Star Wars universe? Then click over here and take a look at these treats. I knew it. Honor just couldn't resist a weekly posting of Star Wars. LFL is a satanic anagram. Kali Ma! I think they're really getting ridiculous trying to force the merge of Disney characters and Star Wars. Why didn't they "Disneyfy" Yoda? Or use a green stitch? Hey Mola, if you don't like this you're going to hate that 12 part series that Decadent Dave and THX-1138 are coming up with! Am... I supposed to be ... turned on by Minnie? "Hey Mola, if you don't like this you're going to hate that 12 part series that Decadent Dave and THX-1138 are coming up with!" No 12 parter is coming. But more Star Wars is.